This article is about the palace in Granada, Spain. For other uses, see Alhambra (disambiguation). The Alhambra (/ælˈhæmbrə/; Spanish: [aˈlambɾa]; Arabic: الْحَمْرَاء‎ [ʔælħæmˈɾˠɑːʔ], Al-Ḥamrāʾ, lit. "The Red One") is a palace and fortress complex located in Granada, Andalusia, Spain. It was originally constructed as a small fortress in AD 889 on the remains of Roman fortifications, and then largely ignored until its ruins were renovated and rebuilt in the mid-13th century by the Nasrid emir Mohammed ben Al-Ahmar of the Emirate of Granada, who built its current palace and walls. It was converted into a royal palace in 1333 by Yusuf I, Sultan of Granada. After the conclusion of the Christian Reconquista in 1492, the site became the Royal Court of Ferdinand and Isabella (where Christopher Columbus received royal endorsement for his expedition), and the palaces were partially altered in the Renaissance style. In 1526 Charles I & V commissioned a new Renaissance palace better befitting the Holy Roman Emperor in the revolutionary Mannerist style influenced by humanist philosophy in direct juxtaposition with the Nasrid Andalusian architecture, but it was ultimately never completed due to Morisco rebellions in Granada. Alhambra's last flowering of Islamic palaces was built for the last Muslim emirs in Spain during the decline of the Nasrid dynasty, who were increasingly subject to the Christian Kings of Castile. After being allowed to fall into disrepair for centuries, the buildings occupied by squatters, Alhambra was rediscovered following the defeat of Napoleon, who had conducted retaliatory destruction of the site. The rediscoverers were first British intellectuals and then other north European Romantic travelers. It is now one of Spain's major tourist attractions, exhibiting the country's most significant and well-known Islamic architecture, together with 16th-century and later Christian building and garden interventions. The Alhambra is a UNESCO World Heritage Site and the inspiration for many songs and stories. Moorish poets described it as "a pearl set in emeralds", an allusion to the colour of its buildings and the woods around them. The palace complex was designed with the mountainous site in mind and many forms of technology were considered. The park (Alameda de la Alhambra), which is overgrown with wildflowers and grass in the spring, was planted by the Moors with roses, oranges, and myrtles; its most characteristic feature, however, is the dense wood of English elms brought by the Duke of Wellington in 1812. The park has a multitude of nightingales and is usually filled with the sound of running water from several fountains and cascades. These are supplied through a conduit 8 km (5.0 mi) long, which is connected with the Darro at the monastery of Jesus del Valle above Granada. Alhambra derives from the Arabic الْحَمْرَاء al-Ḥamrāʼ (f.), meaning "the red one", the complete form of which was الْقَلْعَةُ ٱلْحَمْرَاءُ al-Qalʻat al-Ḥamrāʼ "the red fortress (qalat)". 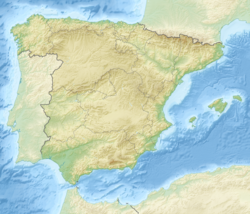 The "Al-" in "Alhambra" means "the" in Arabic, but this is ignored in general usage in both English and Spanish, where the name is normally given the definite article. The Tower of Justice (Puerta de la Justicia) is the original entrance gate to the Alhambra, built by Yusuf I in 1348. Completed towards the end of Muslim rule of Spain by Yusuf I (1333–1353) and Muhammed V, Sultan of Granada (1353–1391), the Alhambra is a reflection of the culture of the last centuries of the Muslim rule of Al Andalus, reduced to the Nasrid Emirate of Granada. It is a place where artists and intellectuals had taken refuge as the Reconquista by Spanish Christians won victories over Al Andalus. The Alhambra integrates natural site qualities with constructed structures and gardens, and is a testament to Moorish culture in Spain and the skills of Muslim, Jewish, and Christian artisans, craftsmen, and builders of their era. Detail of Islamic calligraphy in Mexuar Hall: و لا غالب إلا الله, "There is no victor but God"
The first reference to the Qal‘at al-Ḥamra was during the battles between the Arabs and the Muladies (people of mixed Arab and European descent) during the rule of the ‘Abdullah ibn Muhammad (r. 888–912). In one particularly fierce and bloody skirmish, the Muladies soundly defeated the Arabs, who were then forced to take shelter in a primitive red castle located in the province of Elvira, presently located in Granada. According to surviving documents from the era, the red castle was quite small, and its walls were not capable of deterring an army intent on conquering. The castle was then largely ignored until the eleventh century, when its ruins were renovated and rebuilt by Samuel ibn Naghrela, vizier to the emir Badis ben Habus of the Zirid Dynasty of Al Andalus, in an attempt to preserve the small Jewish settlement also located on the natural plateau, Sabikah Hill. The design included plans for six palaces, five of which were grouped in the northeast quadrant forming a royal quarter, two circuit towers, and numerous bathhouses. During the reign of the Nasrid Dynasty, the Alhambra was transformed into a palatine city, complete with an irrigation system composed of acequias for the gardens of the Generalife located outside the fortress. Previously, the old Alhambra structure had been dependent upon rainwater collected from a cistern and from what could be brought up from the Albaicín. The creation of the Sultan's Canal solidified the identity of the Alhambra as a palace-city rather than a defensive and ascetic structure. The hydraulic system includes two long water channels and several sophisticated elevation devices to bring water onto the plateau. The last Nasrid sultan, Muhammad XII of Granada, surrendered the Emirate of Granada in 1492 without the Alhambra itself being attacked when the forces of the Reyes Católicos, King Ferdinand II of Aragon and Queen Isabella I of Castile, took the surrounding territory with a force of overwhelming numbers. The decoration within the palaces comes from the last great period of Andalusian art in Granada. With little of the Byzantine influence of contemporary Abassid architecture, artists endlessly reproduced the same forms and trends, creating a new style that developed over the course of the Nasrid Dynasty. The Nasrids used freely all the stylistic elements that had been created and developed during eight centuries of Muslim rule in the Peninsula, including the Caliphate horseshoe arch, the Almohad sebka (a grid of rhombuses), the Almoravid palm, and unique combinations of them, as well as innovations such as stilted arches and muqarnas (stalactite ceiling decorations). Structurally, the design is simple and does not evince significant innovation. While artistically pleasing it was until the reconquest structurally ad hoc and reliant on the skills of subject artisans and workers. Columns and muqarnas appear in several chambers, and the interiors of numerous palaces are decorated with arabesques and calligraphy. The arabesques of the interior are ascribed to, among other sultans, Yusuf I, Mohammed V, and Ismail I, Sultan of Granada. After the Christian conquest of the city in 1492, the conquerors began to alter the Alhambra. The open work was filled up with whitewash, the painting and gilding effaced, and the furniture soiled, torn, or removed. Charles I (1516–1556) rebuilt portions in the Renaissance style of the period and destroyed the greater part of the winter palace to make room for a Renaissance-style structure which was never completed. Philip V (1700–1746) Italianised the rooms and completed his palace in the middle of what had been the Moorish building; he had partitions constructed which blocked up whole apartments. Over subsequent centuries the Moorish art was further damaged, and in 1812 some of the towers were destroyed by the French under Count Sebastiani. In 1821, an earthquake caused further damage. Restoration work was undertaken in 1828 by the architect José Contreras, endowed in 1830 by Ferdinand VII. After the death of Contreras in 1847, it was continued by his son Rafael (died 1890) and his grandson. Especially notable was the intervention of Leopoldo Torres Balbás in the 1930s: the young architect "opened arcades that had been walled up, re-excavated filled-in pools, replaced missing tiles, completed inscriptions that lacked portions of their stuccoed lettering, and installed a ceiling in the still unfinished palace of Charles V". According to the site's current architect, Pedro Salmeron Escobar, the Alhambra evolved organically over a period of several centuries from the ancient hilltop fortress defined by a narrow promontory carved by the river Daro and overlooking the Vega or Plain of Granada as it descends from the Sierra Nevada. The red earth from which the fortress is constructed is a granular aggregate held together by a medium of red clay which gives the resulting layered brick- and stone- reinforced construction (tapial calicastrado) its characteristic hue and is at the root of the name of 'the Red Hill'. This crude earthiness is counterpointed by the startling fine alabaster white stucco work of the famous interiors. Meltwater from the 'Snowy Mountains' is drawn across an arched vault at the eastern tip of the Torre del Agua ('Water Tower') and channeled through the citadel via a complex system of conduits (acequia) and water tanks (los albercones) which create the celebrated interplay of light, sound and surface. Alhambra is about 740 metres (2,430 ft) in length by 205 metres (670 ft) at its greatest width. It extends from west-northwest to east-southeast and covers an area of about 142,000 square metres (1,530,000 sq ft) or 35 acres. The Alhambra's most westerly feature is the Alcazaba (citadel), a strongly fortified position built to protect the original post-Roman districts of Iliberri, now 'Centro', and Gárnata al-yahūd ('Granada of the Jews', now Realejo, and the Moorish suburb of El Albayzín. Plan of the Nasrid Palaces, Alhambra, 1889. Due to touristic demand, modern access runs contrary to the original sequence which began from a principal access via the Puerta de la Justicia (Gate of Justice) onto a large souq or public market square facing the Alcazaba, now subdivided and obscured by later Christian-era development. From the Puerta del Vino (Wine Gate) ran the Calle Real (Royal Street) dividing the Alhambra along its axial spine into a southern residential quarter, with mosques, hamams (bathhouses) and diverse functional establishments, and a greater northern portion, occupied by several palaces of the nobility with extensive landscaped gardens commanding views over the Albayzin. All of this was subservient to the great Tower of the Ambassadors in the Palacio Comares, which acted as the royal audience chamber and throne room with its three arched windows dominating the city. The private, internalised universe of the Palacio de Los Leones (Palace of the Lions) adjoins the public spaces at right angles (see Plan illustration) but was originally connected only by the function of the Royal Baths, the Eye of Aixa's Room serving as the exquisitely decorated focus of meditation and authority overlooking the refined garden of Lindaraja/Daraxa toward the city. The rest of the plateau comprises a number of earlier and later Moorish palaces, enclosed by a fortified wall, with thirteen defensive towers, some such as the Torres de la Infanta and Cattiva containing elaborate vertical palaces in miniature. The river Darro passes through a ravine on the north and divides the plateau from the Albaicín district of Granada. Similarly, the Assabica Valley, containing the Alhambra Park, lies on the west and south, and, beyond this valley, the almost parallel ridge of Monte Mauror separates it from the Antequeruela district. Another ravine separates it from the Generalife, the summer pleasure gardens of the emir. Escobar notes that the later planting of deciduous elms obscures the overall perception of the layout, so a better reading of the original landscape is given in winter when the trees are bare. The Alhambra resembles many medieval Christian strongholds in its threefold arrangement as a castle, a palace and a residential annex for subordinates. The alcazaba or citadel, its oldest part, is built on the isolated and precipitous foreland which terminates the plateau on the northwest. All that remains are its massive outer walls, towers and ramparts. On its watchtower, the 25 m (85 ft) high Torre de la Vela, the flag of Ferdinand and Isabella was first raised as a symbol of the Spanish conquest of Granada on 2 January 1492. A turret containing a large bell was added in the 18th century and restored after being damaged by lightning in 1881. Beyond the Alcazaba is the palace of the Moorish rulers, The Nasrid Palaces or Alhambra proper, and beyond this is the Alhambra Alta (Upper Alhambra), originally occupied by officials and courtiers. Access from the city to the Alhambra Park is afforded by the Puerta de las Granadas (Gate of Pomegranates), a triumphal arch dating from the 15th century. A steep ascent leads past the Pillar of Charles V, a fountain erected in 1554, to the main entrance of the Alhambra. This is the Puerta de la Justicia (Gate of Justice), a massive horseshoe archway surmounted by a square tower and used by the Moors as an informal court of justice. The hand of Fatima, with fingers outstretched as a talisman against the evil eye, is carved above this gate on the exterior; a key, the symbol of authority, occupies the corresponding place on the interior. A narrow passage leads inward to the Plaza de los Aljibes (Place of the Cisterns), a broad open space which divides the Alcazaba from the Moorish palace. To the left of the passage rises the Torre del Vino (Wine Tower), built in 1345 and used in the 16th century as a cellar. On the right is the palace of Charles V, a smaller Renaissance building, to construct which part of the Alhambra, including the original main entrance, was torn down. The Royal Complex (Plaza de Nazaríes) consists of three main parts: Mexuar, Serallo, and the Harem. The Mexuar is modest in decor and houses the functional areas for conducting business and administration. Strapwork is used to decorate the surfaces in Mexuar. The ceilings, floors, and trim are made of dark wood and are in sharp contrast to white, plaster walls. Serallo, built during the reign of Yusuf I in the 14th century, contains the Patio de los Arrayanes (Court of the Myrtles). Brightly colored interiors featured dado panels, yesería, azulejo, cedar, and artesonado. Artesonado are highly decorative ceilings and other woodwork. Lastly, the Harem is also elaborately decorated and contains the living quarters for the wives and mistresses of the Arab monarchs. This area contains a bathroom with running water (cold and hot), baths, and pressurized water for showering. The bathrooms were open to the elements in order to allow in light and air. The present entrance to the Palacio Árabe (Arab palace), or Casa Real, is by a small door from which a corridor connects to the Patio de los Arrayanes (Court of the Myrtles), also called the Patio de la Alberca (Court of the Blessing or Court of the Pond), from the Arabic birka, "pool". The birka helped to cool the palace and acted as a symbol of power. Because water was usually in short supply, the technology required to keep these pools full was expensive and difficult. This court is 42 m (140 ft) long by 22 m (74 ft) broad, and in the centre there is a large pond set in the marble pavement, full of goldfish, and with myrtles growing along its sides. There are galleries on the north and south sides; the southern gallery is 7 m (23 ft) high and supported by a marble colonnade. Underneath it, to the right, was the principal entrance, and over it are three windows with arches and miniature pillars. From this court, the walls of the Torre de Comares are seen rising over the roof to the north and reflected in the pond. The Salón de los Embajadores (Hall of the Ambassadors) is the largest room in the Alhambra and occupies all the Torre de Comares. It is a square room, the sides being 12 m (37 ft) in length, while the centre of the dome is 23 m (75 ft) high. This was the grand reception room, and the throne of the sultan was placed opposite the entrance. The grand hall projects from the walls of the palace, providing views in three directions. In this sense, it was a "mirador" from which the palace's inhabitants could gaze outward to the surrounding landscape. The tiles are nearly 4 ft (1.2 m) high all round, and the colours vary at intervals. Over them is a series of oval medallions with inscriptions, interwoven with flowers and leaves. There are nine windows, three on each facade, and the ceiling is decorated with white, blue and gold inlays in the shape of circles, crowns and stars. The walls are covered with varied stucco works, surrounding many ancient escutcheons. In the centre of the court is the Fountain of the Lions, an alabaster basin supported by the figures of twelve lions in white marble, not designed with sculptural accuracy but as symbols of strength, power, and sovereignty. Each hour one lion would produce water from its mouth. At the edge of the great fountain there is a poem written by Ibn Zamrak. This praises the beauty of the fountain and the power of the lions, but it also describes their ingenious hydraulic systems and how they actually worked, which baffled all those who saw them. The Sala de los Abencerrajes (Hall of the Abencerrages) derives its name from a legend according to which the father of Boabdil, the last sultan of Granada, having invited the chiefs of that line to a banquet, massacred them here. This room is a perfect square, with a lofty dome and trellised windows at its base. The roof is decorated in blue, brown, red and gold, and the columns supporting it spring out into the arch form in a remarkably beautiful manner. Opposite to this hall is the Sala de las dos Hermanas (Hall of the two Sisters), so-called from two white marble slabs laid as part of the pavement. These slabs measure 500 by 220 cm (15 by 7½ ft). There is a fountain in the middle of this hall, and the roof — a dome honeycombed with tiny cells, all different, and said to number 5000 — is an example of the "stalactite vaulting" of the Moors. Of the outlying buildings connected to the Alhambra, the foremost in interest is the Palacio de Generalife or Gineralife (the Muslim Jennat al Arif, "Garden of Arif," or "Garden of the Architect"). This villa dates from the beginning of the 14th century but has been restored several times. The Villa de los Martires (Martyrs' Villa), on the summit of Monte Mauror, commemorates by its name the Christian slaves who were forced to build the Alhambra and confined here in subterranean cells. The Torres Bermejas (Vermilion Towers), also on Monte Mauror, are a well-preserved Moorish fortification, with underground cisterns, stables, and accommodation for a garrison of 200 men. Several Roman tombs were discovered in 1829 and 1857 at the base of Monte Mauror. Among the other features of the Alhambra are the Sala de la Justicia (Hall of Justice), the Patio del Mexuar (Court of the Council Chamber), the Patio de Daraxa (Court of the Vestibule), and the Peinador de la Reina (Queen's Robing Room), in which there is similar architecture and decoration. The palace and the Upper Alhambra also contain baths, rows of bedrooms and summer-rooms, a whispering gallery and labyrinth, and vaulted sepulchres. The original furniture of the palace is represented by one of the famous Alhambra vases, very large Hispano-Moresque ware vases made in the Sultanate to stand in niches around the palace. These famous examples of Hispano-Moresque ware date from the 14th and 15th centuries. The one remaining in the palace, from about 1400, is 1.3 m (4 ft 3 in) high; the background is white and the decoration is blue, white and gold. Washington Irving's Tales of the Alhambra. This is a collection of essays, verbal sketches, and stories. Irving lived in the palace while writing the book and was instrumental in introducing the site to Western audiences. Amin Maalouf's Leo Africanus, depicting the reconquest of Granada by the Catholic Monarchs. Philippa Gregory's The Constant Princess, depicting Catalina the Infanta of Spain as she lived in the Alhambra after her parents took Granada. Federico Garcia Lorca's play Doña Rosita the Spinster, mentioned by title character Dona Rosita in her song/speech to the Manola sisters. The plot of the Ballet-héroïque entitled Zaïde, Reine De Grenade, by the French Baroque composer Joseph-Nicolas-Pancrace Royer (c. 1705–1755), takes place at the Alhambra. Alhambra has directly inspired musical compositions as Francisco Tárrega's famous tremolo study for guitar Recuerdos De La Alhambra. Claude Debussy's piece for two pianos composed in 1901, Lindaraja, and the prelude, La Puerta Del Vino, from the second book of preludes composed from 1912 to 1913. Isaac Albéniz wrote a piano suite Recuerdos De viaje, which included a piece called "En La Alhambra", while his suite Iberia contained a piece called "El Albacin". Albéniz also composed a Suite Alhambra, but was uncompleted. "En Los Jardines Del Generalife", the first movement of Manuel de Falla's Noches En Los Jardines De España, and other pieces by composers such as Ruperto Chapí (Los Gnomos De La Alhambra, 1891), Tomás Bretón, and many others are included in a stream referred to by scholars as Alhambrismo. In 1976, filmmaker Christopher Nupen filmed The Song Of The Guitar at the Alhambra which was an hour-long program featuring the legendary Spanish guitarist, Andrés Segovia. British composer Julian Anderson wrote an orchestral piece, Alhambra Fantasy. In pop and folk music, Alhambra is the subject of the Ghymes song of the same name. The rock band The Grateful Dead released a song called "Terrapin Station" on the 1977 album of the same name. It consisted of a series of small compositions penned by Robert Hunter and put to music by Jerry Garcia; a lyrical section of this suite was called "Alhambra". In September 2006, Canadian singer/composer Loreena McKennitt performed live at the Alhambra. The resulting video recordings premiered on PBS and were later released as a 3-disc DVD/CD set called Nights From The Alhambra. The Basque pop group Mocedades performed a song called "Juntos En La Alhambra". Alhambra is the title of an EP recording by Canadian rock band, The Tea Party, containing acoustic versions of a few of their songs. Alhambra and Albaicín are mentioned in the Mago de Oz song named "El Paseo De Los Tristes" from the album entitled Gaia II. On California rapper Dom Kennedy's 2015 album By Dom Kennedy, there is a song entitled "Alhambra". Tessellations like this inspired M.C. Escher's work. The Alhambra tiles are remarkable in that they contain nearly all, if not all, of the seventeen mathematically possible wallpaper groups. This is a unique accomplishment in world architecture. M. C. Escher's visit in 1922 and study of the Moorish use of symmetries in the Alhambra tiles inspired his subsequent work on tessellation, which he called "regular divisions of the plane". Marcel L'Herbier's 1921 film El Dorado features many scenes shot in and around the Alhambra palace. This was the first time permission had been granted for a feature film company to shoot inside the Alhambra palace and L'Herbier gave prominent place to its gardens, fountains and geometric architectural patterns, which became some of the film's most memorable images. Animated films by Spanish director Juan Bautista Berasategui such as Ahmed, El Principe De La Alhambra and El Embrujo Del Sur are based on stories in Washington Irving's Tales of the Alhambra. The Court of the Lions was depicted in Assassin's Creed (2016) when Sultan Muhammad XII surrenders the 'Apple of Eden', a powerful artifact in the center of the movie plot, in exchange for his son's safe return. Both the Court of the Lions and Granada's Albaicin are featured on The animated film Tad Jones: The Hero Returns. The fictional Broadway theatre (the interior actually Auckland, New Zealand's Civic Theatre), in which Kong is displayed as the 'Eighth Wonder of the World' in 2005's King Kong, is named "The Alhambra". 2018 South Korean television series Memories of the Alhambra is based in Granada, Spain. The CEO of an investment company that specializes in optical devices, travels to Granada, Spain to meet the creator of the game. He gets entangled in a mysterious incident, and the border between the real world and the AR world begins to blur. It is a multiplayer location in Assassin's Creed: Brotherhood 's final DLC, The Da Vinci Disappearance and in the mobile multiplayer game Assassin's Creed: Multiplayer Rearmed. This serves as a location for the Spain stage in The King of Fighters (1998). Alhambra is a wonder in Civilization V: Gods & Kings. Alhambra is a wonder in Civilization VI. Dirk Henn's game Der Palast von Alhambra, literally "The Palace of the Alhambra". Players compete to get funds and pay contractors to build the best palace complex. It was published by Queen Games with numerous expansion packs. It won the Spiel des Jahres award in 2003. There is a main belt asteroid named Alhambra. The Alhambra inspired the synagogue Isaac M. Wise Temple. Fernández Puertas, Antonio (1997). The Alhambra. Vol 1: From the Ninth Century to Yusuf I (1354). Saqi Books. ISBN 978-0-86356-466-6. Fernández Puertas, Antonio (1998). The Alhambra. Vol 2: (1354–1391). Saqi Books. ISBN 978-0-86356-467-3. Fernández Puertas, Antonio (1999). The Alhambra. Vol 3: From 1391 to the Present Day. Saqi Books. ISBN 978-0-86356-589-2. Jacobs, Michael; Fernández, Francisco (2009). Alhambra. Frances Lincoln. ISBN 978-0-7112-2518-3. Lowney, Chris. A Vanished World: Medieval Spain's Golden Age of Enlightenment. New York: Simon & Schuster, Inc., 2005. Ruggles, D. Fairchild. "Alhambra," in Encyclopaedia of Islam, third edition. Leiden: E. J. Brill, 2008. Ruggles, D. Fairchild. Gardens, Landscape, and Vision in the Palaces of Islamic Spain, Philadelphia: Pennsylvania State University Press, 2000. Ruggles, D. Fairchild. Islamic Gardens and Landscapes, University of Pennsylvania Press, 2008. García-Pulido, Luis José (September 2016). "The Mastery in Hydraulic Techniques for Water Supply at the Alhambra". Journal of Islamic Studies. 27 (3): 355–382. doi:10.1093/jis/etw016. ^ "Alhambra - historical introduction". Retrieved 2 January 2013. ^ "Alhambra, Generalife and Albayzín, Granada". World Heritage List. UNESCO. Retrieved 13 January 2013. ^ García-Pulido, Luis José (20 June 2016). "The Mastery in Hydraulic Techniques for Water Supply at the Alhambra". Journal of Islamic Studies. 27 (3): 355–382. doi:10.1093/jis/etw016. ISSN 0955-2340. ^ Envisioning Islamic Art and Architecture (ed. David J. Roxburgh). BRILL, 2014. ISBN 9789004280281. P. 18-19. ^ "Alhambra, Granada, Spain". AirPano. Retrieved 23 January 2017. ^ a b c d Mirmobiny, Shadieh. "The Alhambra". Smarthistory at Khan Academy. Retrieved 26 February 2013. ^ Alfonso Lowe, Hugh Seymour-Davies. The Companion Guide to the South of Spain. Companion Guides, 2000. ISBN 9781900639330. P. 8. ^ "CVC. Rinconete. Acordes". Cvc.cervantes.es. Retrieved 4 April 2012. ^ "El alhambrismo en la música española hasta la época de Manuel de Falla – Dialnet". Dialnet.unirioja.es. Retrieved 4 April 2012. ^ "Mathematics in Art and Architecture". Math.nus.edu.sg. Retrieved 4 April 2012. ^ Gelgi, Fatih (July 2010). "The Influence of Islamic Art on M.C. Escher". The Fountain (76). ^ www.area25.es, Area25 IT - (25 August 2017). "Se estrena Tadeo Jones 2. El Secreto del Rey Midas, recreada en la Alhambra y en el Albaicín - Noticias de La Alhambra". ^ "King Kong, 2005". The Worldwide Guide to Movie Locations. Retrieved 27 May 2017. ^ Pete Haas (18 February 2011). "Assassin's Creed Brotherhood Da Vinci Disappearance DLC Announced". CINEMABLEND. Retrieved 14 December 2016. ^ Matt Peckham (25 October 2016). "Review: 'Civilization 6' Fixes Most of the Series' Biggest Flaws". Time. Retrieved 14 December 2016. Al-Hassani, Salim T. S.; Woodcock, Elizabeth; Saoud, Rabah (2007). 1001 Inventions: Muslim Heritage in our World (2nd ed.). Manchester, UK: Foundation for Science Technology and Civilisation. ISBN 978-0-9552426-1-8. Chisholm, Hugh, ed. (1911). "Alhambra, The" . Encyclopædia Britannica. 1 (11th ed.). Cambridge University Press. pp. 656–658. Irwin, Robert (2004). The Alhambra. Cambridge, MA: Harvard University Press. Ruggles, D. Fairchild (1992). "The gardens of the Alhambra and the concept of the garden in Islamic Spain". In Jerrilynn Dodds (ed.). Al-Andalus: The Arts of Islamic Spain. New York, NY: Metropolitan Museum. pp. 163–171. ISBN 978-0-87099-636-8. Salmerón Escobar, Pedro (2007). The Alhambra: Structure and Landscape. La Biblioteca de la Alhambra. Translated by Diana Kelham. ISBN 9788461181230. Wikimedia Commons has media related to Alhambra.